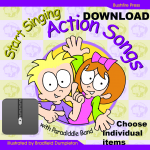 A collection of action based songs performed by Paradiddle Band. Suitable for children in beginning and lower primary school. 15 all-time favourite action songs. 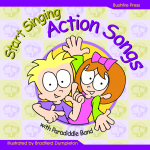 This resource includes lyrics and great illustrations, vocal performances and video demonstrations! 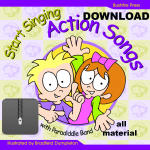 There are three ways to purchase Start Singing action Songs: as a physical book + CD, a download of the entire resource, or you can buy and download individual songs. The choice is yours! Includes the following songs: If You’re Happy And You Know It, The Wheels On The Bus, Johnny Works With One Hammer, Miss Polly Had A Dolly, Ram Sam Sam, Five Little Ducks, The Grand Old Duke Of York, She’ll Be Comin’ Round The Mountain, Little Peter Rabbit, He’s Got The Whole World In His Hands, A Sailor Went To Sea, Sea, Sea, Chester, Eskimo Soccato, Old Macdonald’s Ford, I’ve Got That Happy Feeling.